Faculty award winners for 2017–18 include: (l. to r.) Georgia Athletic Association Professor David Shipley with the O’Byrne Memorial Award for Significant Contributions Furthering Student-Faculty Relations and selected as graduation marshal, Associate Professor Kent Barnett selected as graduation marshal, Cleveland Distinguished Chair of Legal Ethics and Professionalism Lonnie Brown with the Student Bar Association Professionalism Award and Associate Professor Nathan Chapman with the Ellington Award for Excellence in Teaching. 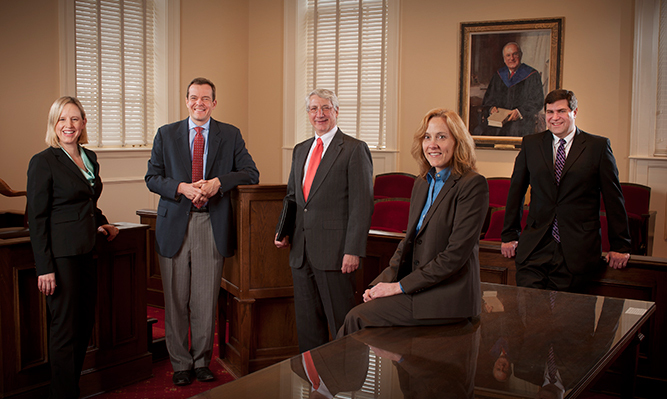 The School of Law's talented faculty includes five former U.S. Supreme Court clerks. They are: (l. to r.) Brumby Distinguished Professor in First Amendment Law Sonja West, Dean Bo Rutledge, University Professor Dan Coenen, Woodruff Chair in International Law Diane Marie Amann and Associate Dean Randy Beck. Faculty are the lifeblood of a law school. Their interests and expertise largely dictate the direction of an institution. At the University of Georgia School of Law, you will find a vibrant, stimulating and exciting learning environment driven by an accomplished corps of superior teachers and scholars. While some law schools choose to emphasize either scholarship or teaching, our law school seeks to balance the two, firmly believing that classroom teaching is enhanced by scholarly expertise. Most professors maintain an open door policy - whenever they are in the office, they are available to answer students' questions about classroom concerns, career advice or personal matters. Most bring practical experience to the classroom as well. Additionally, many law school faculty have been trial and corporate attorneys and continue to accept pro bono cases or to serve as legal consultants. Their work has also been cited in opinions written by judges and justices at various levels, including the U.S. Supreme Court. Of our law school's tenure track faculty, approximately 20 senior members hold prestigious chaired or named professorships. Their expertise is expanded by the addition of outstanding adjuncts, whose ranks include leading attorneys from the region's most powerful firms, international lawyers, judges and government leaders.